Request a quote for a bulk order for Blue ladder - HRP monoclonal antibody. Please fill out the form here below. Your local sales account manager will get in touch with you shortly and send you a quotation based on your requirements. The new Blue ladder - HRP monoclonal antibody allows you to develop your ladder simultaneously with your proteins of interest during western blotting. Simply add this antibody along with your secondary HRP-coupled antibody and visualize your proteins and the blue pre-stained protein ladder on one membrane. PAGE analysis of 5 different protein MW markers: 1. Page Ruler Plus (Thermo, cat. No. 26619); 2. Color Plus broad range (NEB, cat. No. P7711); 3. Page Ruler (Unstained, Fermentas, cat. No. SM0661); 4. Spectra Multicolor (Fermentas, cat. No. SM1859); 5. Precision Plus (Biorad, Cat. No. 161-0373). 4 μl of each marker was loaded on the gel. 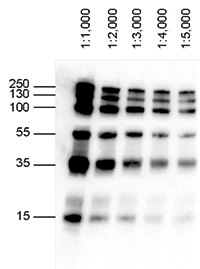 The right panel shows the Western blot analysis with the Diagenode Blue ladder - HRP antibody (Cat. No. C1520202) diluted 1:1,000, using a standard Western blot protocol. 5 μl of the Page Ruler Plus Prestained Protein Ladder (Thermo Scientific, cat. No. 26619) were loaded on a gel and analyzed by Western blot with the Diagenode Blue ladder - HRP antibody (Cat. No. C1520202) used at different dilutions. Figure 2 shows that even with a 1:5,000 dilution all blue prestained bands of the molecular weight marker are clearly visible after a 30” exposure, a typical exposure time for WB analysis. 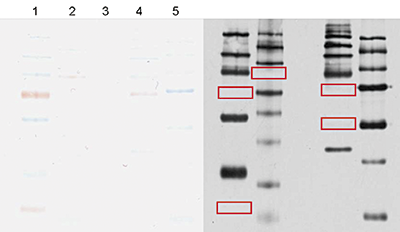 Protein extracts from different species were subjected to SDS-PAGE and analyzed by Western blot with the Diagenode Blue ladder - HRP antibody (Cat. No. C15200202), diluted 1:1,000. The results are shown on the right. The left figure shows a Ponceau staining of the gel. This figure clearly demonstrates that the antibody does not react with any proteins of the species that were tested. Diagenode strongly recommends using this:	Blue ladder - HRP monoclonal antibody (Diagenode Cat# C15200202-100 Lot# 003D). Click here to copy to clipboard.